Beverly K is a fine jewelry designer and manufacturer with distinctive antique styling. 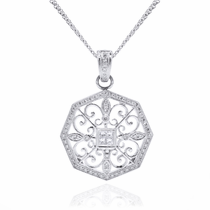 The jewelry collection is noted for it's intricate hand carved designs and attention to detail. Very feminine and romantic in nature. Established in 1999 by Morrie Knopp. The Beverley K collection has had tremendous success in our Modesto, CA jewelry store, Yates & Co Jewelers. Our customers love the high quality detailed vintage styling. Each piece is milled, engraved and polished by hand. You will notice this rare quality when you slip a Beverly K ring on your hand. Priced 35-50% below current market. 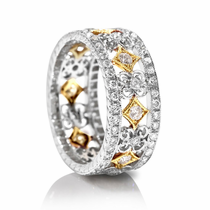 If you want to go all out for a ring with bling, you�ve come to the right place. 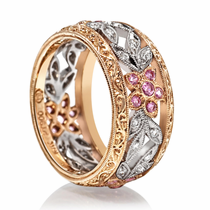 Beverly K rings are intricate, ornate and chock full of glitz and glamor. This fine jewelry designer and manufacturer is known for its antique styling and hand-carved designs with lots of detail. These are rings that are sure to stand the test of time both in durability and in fashion. They are elegant, luxurious and absolutely show-stopping pieces that any woman would be proud to have as part of her personal collection. 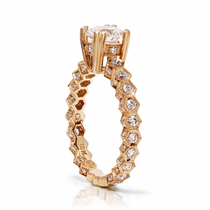 When you propose with a Beverly K engagement ring, you�re almost certain to get the �Yes� you�re looking for. These rings are absolutely stunning since they have a unique style compared to most modern engagement rings. Instead, they feature an heirloom style that makes them instant family keepsakes. A Beverly K wedding band makes for the perfect accent as well. 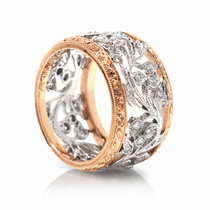 Typically featuring a wider band, these rings leave lots of room to include all those intricate hand-carved details that make them anything but ordinary. For the bride and groom who care about style, durability and meaning in their wedding bands, Beverly K is an excellent choice. Each piece is milled, engraved and polished by hand, so there�s a craftsmanship in these rings that you won�t find with most other designers. The feminine, romantic looks are perfectly fitting for an engagement or wedding, and they�ll be a piece she�s proud to show off for a lifetime. By getting your Beverly K engagement rings or wedding bands from Titanium Jewelry, you get the added bonus of a 30-day money-back guarantee to ensure your satisfaction with every purchase. Plus, our prices are 35 to 50 percent below market, ensuring the best value when looking for this type of top-quality ring.